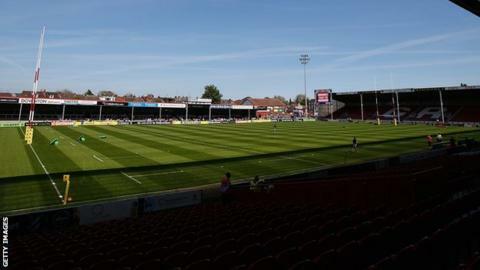 Martin St Quinton has become sole owner of Premiership club Gloucester after buying the Walkinshaw family's share. Club vice chairman and businessman St Quinton bought a 25% stake in the Cherry and Whites in 2008, and later purchased a further 15%. Tom Walkinshaw took over the club in 1997, with son Ryan then replacing the former Formula One team boss, who died in 2010. "This club isn't broken, there's a lot of good things," St Quinton said. "My goal will be to fill the stadium every week, if you can fill the stadium every week you can have a fantastic atmosphere here at Kingsholm, and you're only going to fill the stadium if you're playing attractive rugby and you're winning. "If you can fill the stadium that's the prerequisite to really developing a fantastic club. "At that point you can afford the very best players, the very best coaches, you can develop the stadium, increase the capacity and you've got great momentum." Gloucester are eighth in the Premiership, five points outside the top four.